By law, all employees should be provided with safe access to areas of work, whether at ground level or at height. In many industries, such as petrochemical, process engineering, construction, and manufacturing, regular access is needed to areas by platform or ladder, creating a potential fall hazard. This hazard can be minimised by using a chain or bar, but continued protection relies on these being replaced after use. Self-closing safety gates are Health & Safety Authorities preferred option to chains, mainly because the chains are reliant on the user replacing them. If this isn’t done, then a hazardous void is created. 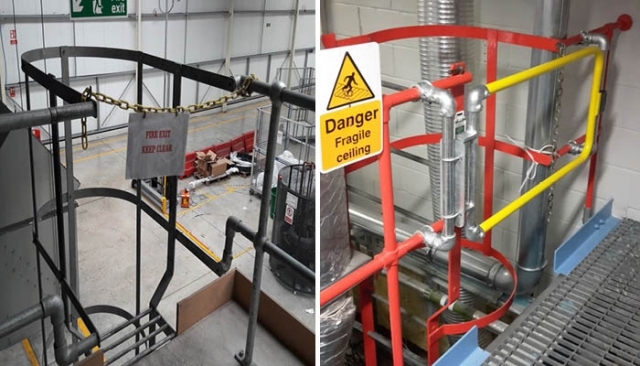 While providing a form of protection and safe access for ladders, guardrails, roof hatches, handrails and stairways, safety chains could potentially add to the risks as they can give a false sense of security. If a chain is to be used it should ideally be constructed so that the complete structure is capable of withstanding a load applied to it. For example, what might happen if someone leans on a safety chain which is being used to provide safe access as part of a roof top edge protection system. The chain could easily give way, potentially causing a serious fall risk. Similarly, if someone holds onto the chain as they ascend a ladder or access a roof via a roof hatch, the chain could break, resulting in the person falling backwards. Self-closing safety gates are installed in the direction of a hazard, this guarantees complete safety for the user and overcomes the potential of creating a fall hazard. Watch our new video explaining why KEE GATE, our self-closing safety gates range, is the ideal safe access solution. KEE GATE spring loaded gates provide a permanent and reliable solution to the hazard and ensure no void is left open at the point of access as they automatically close behind the user.